The Tam, located at 222 Tremont St. in the city’s Theatre District, has closed temporarily. A pair of quintessential Boston bars popular with theatergoers and sports fans have been closed temporarily, according to the investment group behind the establishments. 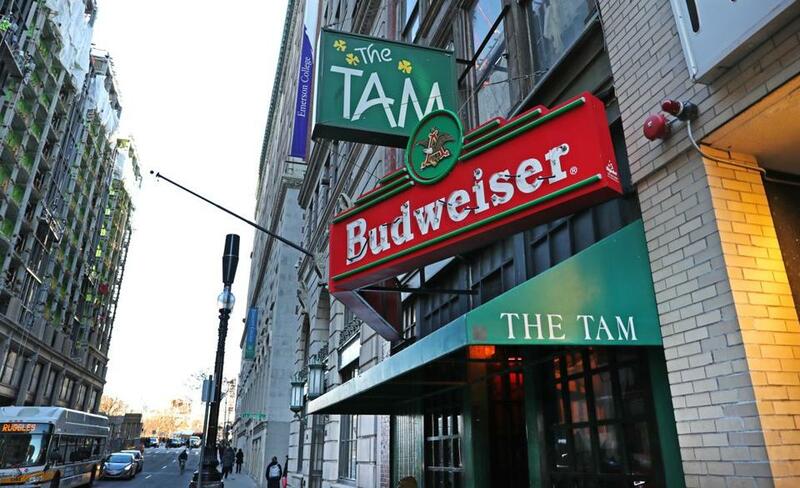 The Tam, located on Tremont Street in the city’s Theatre District, and Sullivan’s Tap, on Canal Street in the city’s former West End, have been shuttered for the time being, but the plan is to reopen both bars “as soon as possible,” confirmed Julius Sokol, a representative of Greater Boston Bar Co., in an e-mail. “We are near the finish line and beyond excited to get these bars up and running again. These establishments will reopen as soon as possible and will have eventual improvements and updates to enhance the customer experience,” Sokol said. Wednesday night, both establishments remained closed. Steel gates were pulled down and locked over Sullivan’s Tap’s Friend Street and Canal Street entrances, while the Tam’s front door was locked. The staff is small. There’s a day bartender and two bartenders and two doormen each night, said Grande. “Supposedly, they’re going to get back in touch with us and I hope they do,” Grande said during a phone interview on Tuesday night. Grande said the previous owners had owned the bar since 1968. She is hopeful the new ownership won’t mess with a Theatre District institution. Grande said working at the bar for 14 years has allowed her to meet “people from all around the world.” Rock star Billy Gibbons, Jakob Dylan, of The Wallflowers fame, and countless comedians, including Jim Jefferies and Massachusetts native Bill Burr, have entered the Tam during her time at the bar. Gibbons was one of the few she asked for a picture with. “I just loved ZZ Top,“ said Grande. The bar welcomed people from all walks of life, she said. In the evening there would be people who lived in the area but weren’t students. Later, the student crowd would filter in. Some nights, the “club kids” would stop in before they danced the night away. Drinks at the Tam were usually cheaper than what the clubs offered, said Grande. Pabst Blue Ribbons and Rolling Rocks were $3, well drinks were $6. Other nights it would be folks on their way to catch a show at the Wilbur or a pub crawl from a nearby hostel. On Wednesday night, several would-be patrons, pulled on The Tam’s locked front door, only to be met with disappointment. “I never go to a show in the Theatre District without coming here and doing my pregame,” said Lee Rothstein, a 52-year-old drummer and homemaker from Medfield. Sam Doran, a 24-year-old who lives in the North End, said he has been frequenting the bar for three years. “A lot of folks are mourning this closure as the last of dirty old Boston, but this place is timeless,” he said. He said the place’s charm was simple: cheap drinks, good service, and a jukebox. “We don’t need an enhanced customer experience,” he said. Emily Sweeney of the Globe staff contributed to this report. Danny McDonald can be reached at daniel.mcdonald@globe.com. Follow him on Twitter @Danny__McDonald.